Opens Thursday 5th July 6 – 8 pm, on display until Sunday 29th July. Our 5th Emerging Artist Awards exhibition for those that are still finding their 'art feet' with two fortunate artists coming away with an arts grant to help further their arts careers. Two respected judges will award grants to fresh new talent – one $1000 Arts West Grant, including a plaque that the artist will hold for one year and one $500 Arts West Grant. This concept was developed to bring out our hidden (emerging) talent – the ones that have had little or no exposure to the public - and assist them by guiding them through a number of processes they will need to understand as they emerge: applications for awards, competitions, funding – exhibiting – advertising – building databases of buyers, galleries etc. The Emerging Artists Awards Grants have a mandatory ‘accountability process’ that the recipients will also be guided through. The grants must be spent to further artistic endeavour (not to catch up on unpaid fines etc). • 20 finalists - Exhibited in the Upstairs Gallery for 3 weeks. 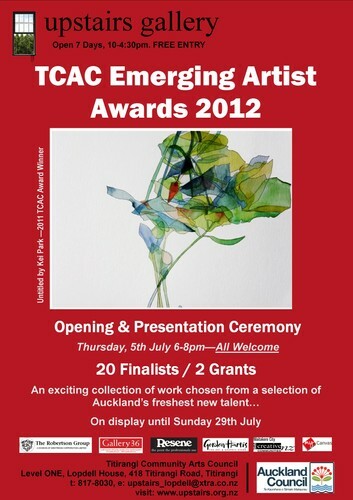 • The TCAC Emerging Artist is: coming into view; coming into existence; coming to maturity. • The artists should not yet be contracted by a commercial gallery. • They should not yet have had major exhibitions (mainly referring to solo exhibitions) in museums and exhibition halls. • There are no requirements for academic standards, e.g. Self taught artists are welcome to apply. • The artists should now be ready to present their work on the exhibition market. • The TCAC Emerging Artist Awards does not discriminate in terms of the age of the applicants and hereby invites artists of all age groups who comply with the application criteria and the definition of an emerging artist to send their applications.